Cleanscene yet again proved to be a highly appealing attraction for the Industry. Held in Melbourne at the Exhibition Centre at Docklands in conjunction with the Safety in Action show there were an array of established companies and new ventures on show with International Exhibitors an interesting addition to the event. Commencing on Tuesday morning September 15th, there was a steady flow of visitors through the venue on what started out as a rainy day. 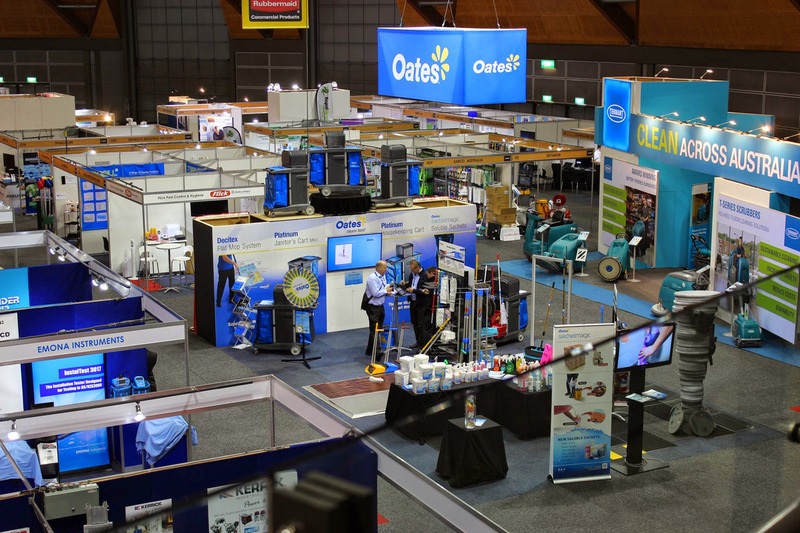 The comments received by the organisers and the NCSA Representatives were that, whilst a little lower in number than anticipated for a Melbourne event, the quality of visitor was of an extremely high standard, with the valuable enquiries and leads to follow, being highly praised by exhibitors. Second day, Wednesday 16th, saw a much higher rate of visitor flow, and again, comments were received from Exhibitors regarding the extent of high value enquiries, orders and follow up leads to be undertaken shortly after the show. The mix of these being over a vast array of goods, from highly priced Machinery, through to small “everyday” style products and services. The Cleanscene Gala Dinner was held on Wednesday night, commencing at 6:30pm at the Sealife Aquarium, Coral Attol Room. Guests were amazed at the display of marine life and in particular, the over 5metre crocodile on display during the pre-dinner drinks, canapes and right through the entire dinner presentation. The dinner also saw presentation of Cleanscne Awards for stands, Innovative Product and also the Legends of Cleaning Perpetual Trophy. The Legends of Cleaning Trophy was awarded to Terry Fraser for his outstanding contribution to the Industry over 40+ years. His daughter Suzanne accepted the award on his behalf, as ill health prohibited Terry from personally attending to accept it. Suzanne gave a very moving acceptance speech on behalf of Terry and stated that he would be extremely proud of the recognition. Best Overall stand and display was awarded to OATES, for a high quality visual and demonstration activity stand. Most Innovative Product Award was awarded to ABCO for their new IMOP, which was a hugely popular demonstration venue for visitors. Day 3, Thursday 17th, saw a great influx of visitors to be serviced by some very “ dusty” exhibitors , after the fabulous night before, where the comments were of the highest praise for all aspects of the venue, the meal & drinks and the presentation of awards, Everyone who attended commented on how successful the evening was. Day 3 again saw positive business leads, orders and follow up requests covering all exhibitors. Images from the show and the dinner will available on the NCSA website. The NCSA Board would like to extend their thanks to all participants in the show and for the way in which they contributed to another highly successful event.